The weather in Jamaica affords this island the reputation of being a tropical island paradise. Jamaica is situated in the heart of the Caribbean Sea, south of Cuba and West of Haiti. Jamaica is one of the Greater Antilles islands. The Caribbean island experiences a tropical equatorial climate, which is hot and humid all year round, but the interior mountainous regions are more temperate. Jamaica doesn’t have four defined seasons, as it lies so close to the equator. The island can be divided into two parts, the windward side, north of the Blue Mountains and the leeward side to the south of the Blue Mountains. The windward side of Jamaica experiences more rainfall and is better known for its tropical climates characterised by hot and humid days and rainfall throughout the year, particularly in May, June, September and November. The leeward side of Jamaica experiences less rain and less humidity. The Blue Mountains tend to be much cooler than Jamaica's beach towns. Temperatures in Jamaica average between 20 and 35 degrees Celsius (68 to 95 degrees Fahrenheit) throughout year. The summer months of May, June, July, August, September and October are slightly warmer than the winter months. However the days are cooled down by a refreshing onshore breeze; known locally as the ‘doctor breeze’. 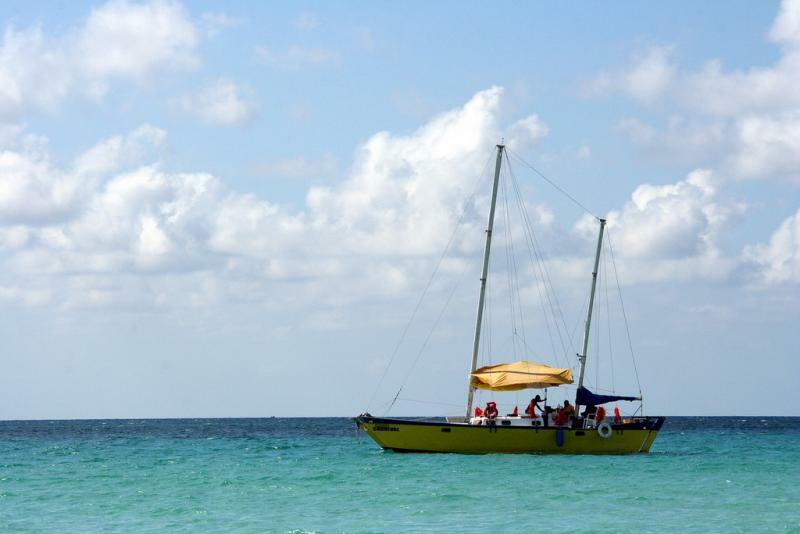 At night the breeze changes direction, this offshore breeze is called the ‘undertakers breath’ in Jamaica. Summer is also the time of year with the most rainfall in Jamaica and the end of summer marks the beginning of the Caribbean’s hurricane season. Jamaica’s winter months are November, December, January, February, March and April. Temperatures range from 20 to 31 degrees Celsius (68 to 89 degrees Fahrenheit) and the island nation experiences less rainfall. The winter months are the perfect time to visit Jamaica and enjoy the island’s tropical maritime climate. Jamaica lies in the famous Hurricane Belt, which includes the Gulf of Mexico and the Caribbean Sea. Hurricane season tends to take place in late summer, from July to October, with August and September being the most active months in the Caribbean region. This is the worst time to visit Jamaica. The rest of the year is perfect for a vacation in Jamaica. Peak holiday season in Jamaica runs from November to April, particularly during North America’s winter break. What to pack for a holiday in Jamaica? It's shorts and T-shirts, board shorts and bikini's year-round here on this tropical island. Pack light coloured and lightweight clothing for the trip, preferably with materials that dry quickly. Take at least one change of swimwear, and some light coverings the scorching sun, as well as chilly evenings and windy days– things like a sarong, loose and light long sleeved shirts, a light top and hats. Sandals are standard, but many people choose to walk barefoot at the beach, while light, breathable amphibian shoes or trainers are necessary for treks and some island adventures. Save smart clothing for a special restaurant or outing, but the island style here is typically neither too casual nor formal, so it’s easy to fit in. Note: January in Jamaica is jam-packed with parties and festivals. Events: The most popular festival in Jamaica in January is Rebel Salute. It is held on Jamaica’s south coast in St. Elizabeth on Tony Rebel’s birthday each year. Events: To many, Jamaica is synonymous with reggae and Bob Marley; visitors to Jamaica in February can enjoy both at the Bob Marley festival in Kingston. February in Jamaica marks the beginning of Bacchanal Jamaica – an annual party that takes over the streets of Jamaica until its finale in May. Note: March is the ideal time to book a flight to Jamaica. Kingston, Montego Bay, Negril and all the islands smaller towns are in festival mode during March as this is a key carnival month in Jamaica. Note: April is generally the month of Easter; Jamaicans celebrate this holiday with festivities and parties. Visitors staying at beachside resorts or in Jamaica’s main towns of Kingston, Montego Bay, Ocho Rios and Negril can expect to be invited to join in the festivities and celebrate in true Jamaican style. Events: Jamaica’s festival, Bacchanal Jamaica, comes to an end in May; visitors can expect carnival events and parades in all of Jamaica’s small towns and cities such as Montego Bay, Negril and Kingston. Events: Jazz lovers will be in their element in Jamaica in June. The Ochos Rios International Jazz Festival has been held every year for the past twenty years. The festival gets bigger every year and attracts Jazz enthusiasts to the wonderful laid-back island of Jamaica. Events: If jamming to the beats of Rihanna, Mary J Blige and Wyclef Jean is your thing, then Jamaica’s Reggae Sumfest, held in July in Montego Bay, is the perfect excuse to book a cheap flight to Jamaica for a beach break. Events: The Independence Street Festival in Kingston is the perfect way to celebrate the island’s independence. Note: Jamaica has two public holidays in August, Emancipation Day on 1 August and Independence Day on 6 August. Note: September is peak hurricane season in Jamaica. From Kingston to Montego Bay and Negril, visitors can expect low-key entertainment and possibly some storm watching as the hurricanes move in and across the Caribbean. Note: Visitors booking flights to Jamaica in October should head to Port Antonio for the Caribbean’s oldest marlin tournament. The Port Antonio Blue Marlin Tournament attracts sightseers, professional anglers and enthusiasts from across the world. Events: Visitors after a Jamaican festival with a difference visitors should make their way to the Fish Festival in Manchioneal. Where the fishing community prides itself in being the best fishers in Portland Parish. Note: November is the beginning of peak holiday season in Jamaica. Events: The town of Negril and its famous Seven Mile Beach is host to the annual Reggae Marathon, where Usain Bolts and regular holidaymakers jog along the beautiful beaches of Jamaica to the beat of reggae tunes. If running isn’t your thing, then the Jamaica’s Christmas and New Years Eve beach parties are the stuff of legends. Note: December is peak season for those visiting Jamaica.